Today I’m speaking at the “Linked Data for Libraries” event organised and hosted by the Library Association of Ireland, Cataloguing & Metadata Group; the Digital Repository of Ireland; and Trinity College Library, Dublin. In the presentation I cover some of the key issues around publishing and consuming linked data, using library based examples. My slides plus speaker notes are available for download – Publishing and Using Linked Data (pdf). In September 2011 the British Museum started publishing descriptions of items in its collections as RDF (the data structure that underlies Linked Data). The data is available from http://collection.britishmuseum.org/ where the Museum have made a ‘SPARQL Endpoint’ available. SPARQL is a query language for extracting data from RDF stores – it can be seen as a parallel to SQL, which is a query language for extract data from traditional relational databases. Although I knew what SPARQL was, and what it looked like, I really hadn’t got to grips with it, and since I’d just recently purchased “Learning SPARQL” it seemed like a good opportunity to get familiar with the British Museum data and SPARQL syntax. So I had a play (more below). Skip forward a few months, and I noticed some tweets from a JISC meeting about the Pelagios project (which is interested in the creation of linked (geo)data to describe ‘ancient places’), and in particular from Mia Ridge and Alex Dutton which indicated they were experiementing with the British Museum data. My previous experience seemed to gel with the experience they were having, and prompted me to finally get on with a blog post documenting my experience so hopefully others can benefit. Perhaps one reason I’ve been a bit reluctant to blog this is that I struggled with the data, and I don’t want this post to come across as overly critical of the British Museum. The fact they have their data out there at all is amazing – and I hope other museums (and archives and libraries) follow the lead of the British Museum in releasing data onto the web. So I hope that all comments/criticisms below come across as offering suggestions for improving the Museum data on the web (and offering pointers to others doing similar projects), and of course the opportunity for some dialogue about the issues. There is also no doubt that some of the issues I encountered were down to my own ignorance/stupidity – so feel free to point out obvious errors. When you arrive at the British Museum SPARQL endpoint the nice thing is there is a pre-populated query that you can run immediately. It just retrieves 10 results, of any type, from the data – but it means you aren’t staring at a blank form, and those ten results give a starting point for exploring the data set. Most URIs in the resulting data are clickable, and give you a nice way of finding what data is in the store, and to start to get a feel for how it is structured. Which is intriguing enough to make you want to know more (I am married, and have to admit I don’t remember any special equipment). Clicking on the URI http://collection.britishmuseum.org/id/object/EAF119772 in a browser takes you to an HTML representation of the resource – a list of all the triples that make statements about the item in the British Museum identified by that URI. From this it is perhaps easy enough to see that there is some item (identified by the URI http://collection.britishmuseum.org/id/object/EAF119772) which has a note related to it stating that it was acquired (presumably by the museum) in 1994. So far, so good. I’d got an idea of the kind of information that might be in the database. So the next question I had was “what kind of queries could I throw at the data that might produce some interesting/useful results?” Since I’d recently been playing around with data about composers I thought it might be interesting to see if the British Museum had any objects that were related to a well-known composer – say Mozart. This is where I started to hit problems…. In my initial explorations, while some information was obvious, I’d also realised that the data was modelled using something called CIDOC CRM, which is intended to model ‘cultural heritage’ data. With some help from Twitter (including staff at the British Museum) I started to read up on CIDOC CRM – and struggled! Even now I’m not sure I’d say I feel completely on top of it, but I now have a bit of a better understanding. Much of the CIDOC model is based around ‘events’ – things that happened at a certain time/in a certain place. This means that often what might seem like a simple piece of information – such as where a item in the museum originates from – become complex. and the results can be seen at http://bit.ly/vojTWq. To make things even more complex the British Museum data seems to describe all items actually as made up of (what I’m calling) ‘sub-items’. In some cases this makes some sense. If a single item is actually made up of several pieces, all with their own properties and provenance, it clearly makes sense to describe each part separately. Each part of the object will have it’s own properties and provenance, and it makes sense to describe these separately. Which I found (and continue to find) this confusing. This isn’t helped in my view by the fact that some properties are attached the the ‘parent’ object, and some to the ‘child’ object, and I can’t really work out the logic associated with this. For example it is the ‘parent’ object that belongs to a department in the British Museum, while it is the ‘child’ object that is made of a specific material. Both the parent and child in this situation are classified as physical objects, and this feels wrong to me. Firstly, after much debate we have concluded that preserving the existing modelling relationship as described earlier whereby each object always consists of at least one part is largely nonsense and should not be preserved. While arguments were put forward earlier for retaining this minimum one part per object scheme, it has now been decided that only objects which are genuinely composed of multiple parts will be shown as having parts. The same document notes that the current modelling “may be slightly counter-intuitive” – I can back up this view! So – back to finding stuff related to Mozart… apart from struggling with the data model, the other issue I encountered was that it was difficult to approach the dataset through anything except a URI for a entity. That is to say, if you knew the URI for ‘Wolfgang Amadeus Mozart’ in the museum data set, the query would be easy, but if you only know a name, then it is much more difficult. How could I find the URI for Mozart, to then find all related objects? ?s ?p "Mozart, Wolfgang Amadeus"
The second approach you can use is to do a more general query and ‘filter’ the result using a regular expression. Regular expressions are ways of looking for patterns in text strings, and are incredibly powerful (supporting things like wildcards, ignoring case etc. etc.). So you can be a lot less precise than searching for an exact string, and for example, you might try to retrieve all the statements about ‘people’ and filter for those containing the (case insensitive) word ‘mozart’. While this would get you Leopold Mozart as well as Wolfgang Amadeus if both are present in the data, there are probably a small enough number of mozarts that you would be able to pick out WA Mozart by eye, and get the relevant URI which identifies him. You can retrieve over 300 results without getting an error. This limitation is an issue in itself (and the British Museum are by no means alone in having performance issues with an RDF triple store), but it is doubly frustrating that the limit is unclear. The difficulty of exploring the British Museum data from a simple textual string became a real frustration as I explored the data – it made me realise that while the Linked Data/RDF concept of using URIs and not literals is something I understand and agree with, as people all we know is textual strings that describe things, so to make the data more immediately usable, supporting textual searches (e.g. via a solr index over the literals in the data) might be a good idea. I got so frustrated that I went looking for ways of compensating. The British Museum data makes extensive use of ‘thesauri’ – lists of terms for describing people, places, times, object types, etc. In theory these thesauri would give the text string entry points into the data, and I found that one of the relevant thesauri (object types) was available on the Collections Link website (http://www.collectionslink.org.uk/assets/thesaurus/Objintro.htm). Each term in this data corresponds to a URI in the British Museum data, and so I wrote a ScraperWiki script which would search for each term in the British Museum data and identify the relevant URI and record both the term and the URI. At the same time a conversation with @portableant on twitter alerted me to the fact that the ‘Portable Antiquities‘ site uses a (possibly modified) version of the same thesaurus for classifying objects, so I added in a lookup of the term on this site to start to form connections between the Portable Antiquities data and the British Museum data. This script is available at https://scraperwiki.com/scrapers/british_museum_object_thesaurus/, but comes with some caveats about the question of how up to date the thesaurus on the Collections Link website is, and the possible imperfections of the matching between the thesaurus and the British Museum data. Unfortunately it seems that this ‘object type’ thesaurus is the only one made publicly available (or at least the only one I could find), while clearly the people and place thesauri would be really interesting, and provide valuable access points into the data. But really ideally these would be built from the British Museum data directly, rather than being separate lists. To find the 9 (as of today) items that are in someway related to Mozart (mostly pictures/engravings of Mozart). The Pelagios wiki has some more information on ‘stumbling blocks’ at http://pelagios.pbworks.com/w/page/48544935/Stumbling%20Blocks, and also the group exploring (amongst other things) the British Museum data made notes at http://pelagios.pbworks.com/w/page/48535503/UK%20Cultural%20Heritage. Also I know that Dominic Oldman from the British Museum was at the meeting, and was keen to get feedback on how they could improve the data or the way it is made available. One thing I felt strongly when I was looking at the British Museum data is that it would have been great to be able to ‘go’ somewhere that others looking at/using the data would also be to discuss the issues. The British Museum provide an email to send feedback (which I’ve used), but what I wanted to do was say things like “am I being stupid?” and “anyone else find this?” etc. As a result of discussion at the Pelagios meeting, and on twitter, Mia Ridge has setup a wiki page for just such a discussion. A final thought. The potential of ‘linked data’ is to bring together data from multiple sources, and combine to give something that is more than the sum of it’s parts. At the moment the British Museum data sits in isolation. How amazing would it be to join up the British Museum ‘people’ records such as http://collection.britishmuseum.org/id/person-institution/39629 with the VIAF (http://viaf.org/viaf/32197206/) or Library of Congress (http://id.loc.gov/authorities/names/n80022788) identifier for the same person, and start to produce searches and results that build on the best of all this data? Rob says that what is missing from the record is the lack of relationships – this is the power you want to exploit. MARC is really really good – but really really outdated – why a 245$$a not ‘Title’ – is it because ‘245’ universally understandable? NO! Because when computing power and space was expensive they could afford 3 characters – that’s why you end up with codes like 245 rather than ‘Title’. Call numbers are like URLs …. Rob pointing up the issues around the way libraries work with subject headings and ‘aboutness’. Libraries talk about ‘concepts’ rather than ‘things’ – a book is about ‘Paris’ not about ‘the concept of Paris’. Says we need to get away from the abstractness of concepts. He sees the use of SKOS as a reasonable thing to do to get stuff out there – but hopes it is a temporary work around which will get fixed. MARC fails us by limiting the amount of data that can be recorded – only 999 fields… need approaches that allow more flexibility. And ability to extend where necessary. FRBR – introduces another set of artificial vocabulary – this isn’t how people speak, it isn’t the language they use. We need to model data and use vocabulary so it can connect to things that people actually talk about – as directly as we realistically can. Rob praises the BL modelling on this front. mentoring and oversight – keep team going, make sure they can ask questions, discuss etc. Mike Taylor from IndexData asks – how many ‘MARC to RDF’ pipelines have been built by people in this room? Four or five in the room. Rob says – lots of experimentation at this stage… this is good… but not sure if we will see this come together – but production level stuff is different to experimental stuff. Rob says ‘subject’ is a relationship – this is how it should be represented. Neil Wilson from the BL doing this talk. Government has been pushing to open up data for a while. This has started to change some expectations around publishing of ‘publicly owned’ data. Begun to offer sets of RDF/XML to various projects etc. BL wanted to offer data allowing useful experimentation and advancing discussion from theory to practice. BNB (British National Bibliography) has lots of advantages – general database of published output – not just ‘BL stuff’; reasonably consistent; good identifiers. Wanted to undertake the work as extension of existing activities – wanted to develop local experitise, using standard hardware for conversion. Starting point was Library MARC21 data. Wanted to focus on data issues not building infrastructure and also on linking to stuff. Incremental approach adopted – with several interations around data and data model. It’s never going to be perfect first time – we expect to make mistakes – have to make sure we learn from there and ensure that everyone benefits from the experience. So if anyone is thinking of undertaking a similar journey – Just do it! What does it have to do with bibliography? Does it make life better for patrons? Want to link project data (in institution, CRIS) to publications resulting from those projects. Data sources – Institutional Repositories – using OpenDOAR as authority on this. 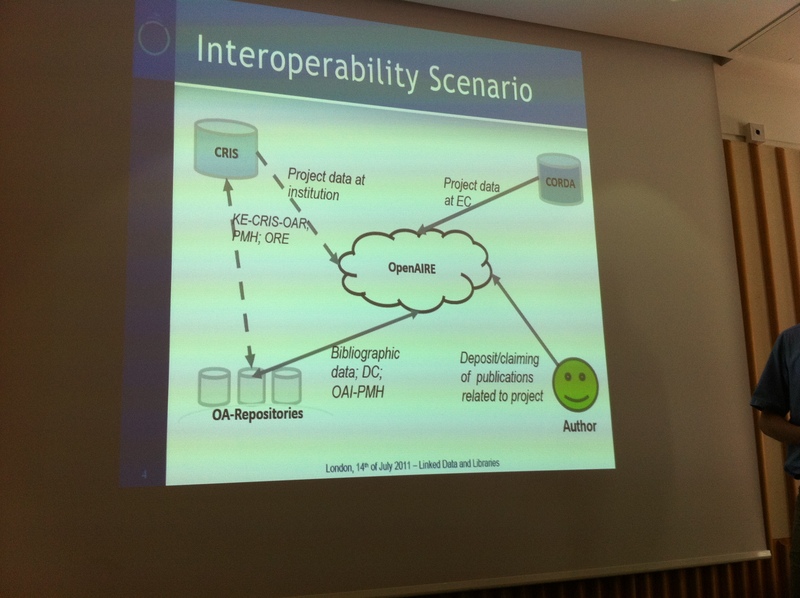 Working group within the ‘quadrolateral Knowledge Exchange-Initiative’ (involving SURF, JISC, DFG, DEFF) – aiming to increase interoperability between CRIS and OAR domains – want to define a lightweight metadata exchange format. Library has central role – hub that provides the publication and want to link all the datasets to the relevant publications in the library. Hope in the future will have pointers from publications (within text) to the data. Have institute of Planetology. Have information about the Moon. To save money they look for areas of the earth with similar characteristics as ‘reference data’ – hope that this will be something they can provide. This session by Phil John – Technical Lead for Prism (was Talis, now Capita). Prism is a ‘next generation’ discovery interface – but built on Linked Data through and through. Now moving to next phase of development – not going to be just about library catalogue data – but also journal metadata; archives/records (e.g. from the CALM archive system); thesis repositories; rare items and special collections (often not done well in traditional OPACs) … and more – e.g. community information systems. When populating Prism from MARC21 – do initial ‘bulk’ conversion, then periodic ‘delat’ files – to keep in sync with LMS. Borrower and availability data is pulled from LMS “live” – via a suite of RESTful web services. Prism is also a Linked Data API… just add .rss to collection of .rdf/.nt/.ttl/.json to items. This means simple to publish RSS feeds of preconfigured searches – e.g. new stock, or new stock in specific subjects etc. Every HTML page in Prism has data behind it you can get as RDF. But have to be realistic – 10s of millions of MARC21 records exist – so need to be able to deal with this. Decided to tackle problem in small chunks. Created a solution that allows you to build a model interatively. Also compartmentalises code for different sections – these can communicate but work separately and can be developed separately. Makes it easy to tweak parts of the model easily. Feel they have a robust solution that performs well – even if it only takes 10 seconds to convert a MARC record – then when you use several million records it takes months. No matter what MARC21 and AACR2 says – you will see variations in real date. First area they tackled was Format (and duration) – good starting point as it allows you to reason more fully about the record – once you know Format you know what kind of data to expect. Once you have an identifier, you start being able to link to other stuff – which is great. … and not just dealing with English records – especially in academic libraries. part of the reason for using linked data – but some challenges…. worse – what if datasource removed permanently? can we display it? is it susceptible to vandalism? More library data as LOD – especially on the peripheries – authority data, author information, etc. LOD replacing MARC21 as standard representation of bibliographic records! This report from Adrian Stevenson from UKOLN. Summit held 2-3 June 2011. Brought together 100 people from around the world, with generous funding from the Internet Archive; National Endowment from the Humanities; Alfred P Sloan foundation. 85 organisations represented from across libraries, archives, museums. Summit aimed to be practical and about actionable approaches to publishing Linked Open Data. Looking at Tools, licensing policy/precedents, definitions and use cases. Meeting ran on a ‘Open Space Technology’ format – some way between a formal conference and an unconference – agenda created via audience proposals – but there were huge numbers of sessions being proposed/run. First day was more discursive, second day about action. A year on from the first Talis Linked Data and Libraries meeting – a lot has happened. The W3C has a group on ‘linked data and libraries’; the BL has released a load of records as RDF/XML – brave decision; Richard went to meeting where in Denmark there was discussion about trying to persuade publishers to release metadata; Europeana Linked Data now available; parts of French National Catalogue etc. etc. While it may feel that progress is slow – people are getting out there and ‘just doing it’ as Lynne Brindley just suggested. Talis – started pioneering in Semantic Web/Linked Data areas. Recently the Library Systems Division has been sold to Capita – allow it to focus on libraries, while ‘Talis’ is going forward with focus on linked data/semantic web. Talis Systems Ltd – Consulting/Training/Evangelism around Linked Data etc. Richard now mentioning Good Relations ontology – adoption by very large commercial organisations. Linked Data ‘cloud’ has got larger – more links – but what are these links for? Links (i.e. http URIs) identify things – and so you can deliver information about things you link to… Richard says lots of the ‘talk’ is about things like SPARQL endpoints etc. But should be about identifying things and delivering information about them. Richard thinks that Libraries have an advantage in entering the Linked Data world – lots of experience, lots of standards, lots of records. We have described things, whereas generally people just have the things they need to describe. Are libraries good at describing things… or just books?